Kevin Wilson had an extraordinary year. The Oklahoma Sooners' offensive coordinator put together the most prolific offense in NCAA history. The Sooners scored more points than any college football team since 1904. They scored 50 points nine times, the most by any team in the history of the game. That included 60 points or more in a record six consecutive games. The 2008 edition set school records for points and total yards. OU had the Heisman Trophy winner (Sam Bradford), became the first Big 12 Conference team with two 1,000-yard rushers (DeMarco Murray and Chris Brown) and four offensive first-team All-Americans (Bradford, Jermaine Gresham, Duke Robinson, Phil Loadholt). Lastly, Wilson was honored with the Frank Broyles Award, given to college football's top assistant coach. In June, Wilson was given a $100,000 raise, easily the highest on the Sooner staff. 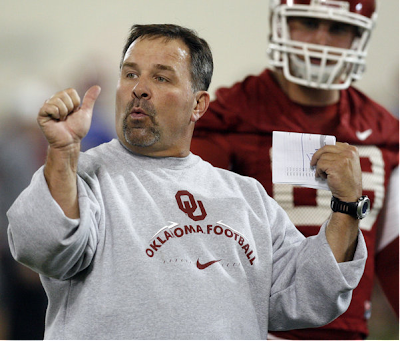 But head coach Bob Stoops said Wilson's raise wasn't necessarily a reflection of his 2008 success. "I think it's a reflection of his success through the years," Stoops said. "It's built and built." Wilson, 47, came to OU in 2002 as the offensive line coach after three seasons as offensive coordinator under the late Randy Walker at Northwestern. Wilson also was offensive coordinator at Miami (Ohio) from 1992-98. At both schools, Wilson and Walker helped innovate the current trend of zone-read options for dual-threat quarterbacks, incorporating it into spread formations that Michigan coach Rich Rodriguez originally created on the NAIA level. "He's one of the early innovators of all of that style of offense, no question," Stoops said. College football coordinators now command salaries once reserved for head coaches. Oklahoma State's four primary coordinators average $312,500. Elsewhere in the Big 12, Texas' coordinators last year were paid $425,000 each; Texas A&M's averaged $365,000. OU defensive coordinator Brent Venables makes $395,000. Wilson's salary now stands at $385,000. "You can just look at what's happening around the country," Stoops said. "That's what the market reflects." Stoops remains impressed with Wilson's track record of adapting his system and play-calling to the Sooner roster, from Adrian Peterson and Jason White to Paul Thompson and Allen Patrick to Sam Bradford and DeMarco Murray/Chris Brown. Ultra-talented players come and go; replacements are either touted or not. But the OU offense continues to set records annually. "Kevin has been so smart in how he's adapted to our personnel," Stoops said. "He has such an experience in so many different ways in moving an offense; he understands it. He's coached in a variety of spots and he understands, and he plays to our strengths. "That's a compliment to him and our whole offensive staff. He understands what we're good at and what our personnel is good at." Wilson's challenge this season: ensure that an almost entirely new offensive line can provide protection for Bradford and give Murray and Brown effective running space. If four new offensive line starters can't cut it, the Sooner offense could take a significant step back from its 2008 productivity. "In our world, we have to anticipate the worst and prevent the disaster," Wilson said in the spring. "So I'm anticipating the worst. "It's no different than a kid taking a foreign language or an upper-level math, where they're learning. These guys are learning how to play hard, and they're learning how to go every day. That's kind of foreign to a lot of people. It's a foreign skill, bringing your best every day. "It sounds common. But just look in the work force, at your own work environment, and you'll see guys that don't bring it every day. And that's what we're asking these young guys to do."